Do you know of any Pools in Spain that must be listed here? Contact us!. Going to a Romania Swimming Pool is growing specially within the elderly population sectors of Romania, who've suffered some type of muscle or bone damage. Please use the contact information supplied at each pool profile to check if they are providing aquagym lessons, for the reason that is not so frequent to find out an Aquagym in Romania. Thanks to some new pools submitted by swimmers like you, Swimia.com is increasing within the daily number of stored pools. Please don't hesitate to make contact with us when you come across any Romania Swimming Pool with inaccurate or incomplete information and facts. 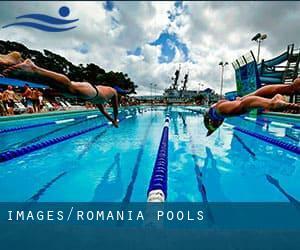 If you are looking for Romania Pools, it's beneficial to know numerous of them belong to gyms or sports centers which also give lessons. Get informed by calling the premises. Please contact the sports center in Romania to check which activities are being offered and their timetables, due to the fact Romania Pools may perhaps have different rules and fares than other places. There are numerous causes why it is best to choose a heated swimming pool in Romania. The most important one relies on the significance of keeping the body temperature stable. If the water is as well cold, your body will try to warm it up and you will lose strength to swim effectively. Enjoy the best indoor pools in Romania and don't worry about the weather. These facilities are open all seasons and you can enjoy a swim at the same temperature every day of the year. Without a shadow of a doubt, swimming in Cluj-Napoca could be the finest solution to unwind right after work. Take a couple of minutes to browse Swimia's catalog to find a Swimming Pool in Cluj-Napoca. Swimming is often a fantastic idea to keep your body active throughout your visit to Bucharest (Romania), or even if you are a local. Swimia assists you to discover your closest Pool in Bucharest. Holding an estimated population of 318.012, Iaşi is one of the most important cities in Romania. Check all the Pool in Iaşi and its surrounding area. Whereas Timişoara is one of the six most populous cities in Romania with nearly 315.053 residents, you shouldn't miss that one if you're going to Romania. Updated on 2019 Bd. Basarabia nr. 37 - 39 , Sector 2 , Bucharest (Postal Code: Unknown). Among all the activities offered by the center, for anyone who is interested in swimming you will get pleasure from Olympic size x 25 meters, Indoors. Just in case you want to contact this Swimming Pool just before dropping by, we only know the phone number. Updated on 2019 Bd. Mircea Eliade, 1 , Area Floreasca , Bucharest (Postal Code: Unknown). This sports center offers 20 meters, 4 lanes, Indoors. For this Swimming Pool, only phone number is number here. Updated on 2019 Splaiul Independentei , Cluj Napoca . Swimmers like you reported Olympic size, 7 lanes, Indoors. Unfortunately we do not have the email address of this Pool, but we can give you the phone number. Updated on 2019 Nordului 107 , Bucharest (Postal Code: Unknown). Among all the activities offered by the center, should you be interested in swimming you'll take pleasure in 25 meters, Indoors. Just in case you want to contact this Pool prior to dropping by, we only know the phone number. Updated on 2019 Calea Dorobantilor, 92A , Timisoara . Swimmers like you reported Olympic size, 8 lanes, Indoors. Unfortunately we do not have the e-mail address of this Swimming Pool, but we can give you the phone number. Updated on 2019 Sos. Nordului 120 , Bucharest (Postal Code: Unknown). Swimmers like you reported 25 meters x 11 meters, 0.8 meters - 2.5 meters depth, 0.8 meters - 2.5 meters depth, Indoors. Unfortunately we do not have the email address of this Pool, but we can provide you with the phone number. Updated on 2019 Str. Popa Marin, 2 , Area Floreasca , Bucharest (Postal Code: Unknown). This sports center delivers 33 meters x 16 meters, 5 lanes, Indoors. For this Pool, only phone number is number here. Updated on 2019 Bd. Poligrafei, 1 , Area Piata Liberei , Bucharest (Postal Code: 013704). Swimmers like you reported 18 meters, Indoors. Unfortunately we do not have the email address of this Swimming Pool, but we can give you the phone number. Updated on 2019 Poiana Brasov , Brasov (Postal Code: 500009). This sports center offers 25 meters x 12.5 meters, 1.5 meters - 2.2 meters depth, 1.5 meters - 2.2 meters depth, Indoors. Contact information for this Swimming Pool for instance phone number and email address are number. Updated on 2019 Calea Victoriei 63-81 , Sector 1 , Bucharest (Postal Code: 010065). Swimmers like you reported 25 meters, 4.5f maximum depth, Indoors. Phone number and email address are number for this Swimming Pool. Updated on 2019 Str. Aviator Popa Marin nr. 2 , Sector 1 , Bucharest (Postal Code: Unknown). Swimmers like you reported 33 meters x 16 meters, Indoors. Unfortunately we do not have the email address of this Swimming Pool, but we can give you the phone number. Updated on 2019 3-5 Poligrafiei Bd. , Sector 1 , Bucharest (Postal Code: 013704). This sports center delivers 25 meters x 10 meters, 1.3 meters - 2.2 meters depth, 1.3 meters - 2.2 meters depth, Indoors. Contact knowledge for this Pool such as phone number and email address are number. Updated on 2019 Liviu Rebreanu street 29/A , Tirgu Mures . This sports center provides 25 meters x 10 meters, 1.85 meters depth, 1.85 meters depth, Indoors. For this Swimming Pool, only phone number is number here. Updated on 2019 Str. Mircea Eliade nr. 1 , Sector 1 , Bucharest (Postal Code: Unknown). Swimmers like you reported 25 meters x 10 meters, 1.75 meters depth, 1.75 meters depth, Indoors. Phone number and e mail address are number for this Swimming Pool.